In his excellent new book Fighting with America, the historian James Curran says that Anzac and ANZUS have become flip sides of the same coinage, though he puts it more elegantly: ‘Support for the US alliance was woven into the Anzac fabric, the slouch hat folding into the nation’s strategic doctrine.’ Mistakenly, ‘the present moment is being sanctified as the norm,’ he observes. So pervasive has become this ‘narrative of common endeavour that it stifles discussion of alternative policy options for Australia’. James Curran discards the red, white and blue-tinted spectacles that have produced a romanticised view of the US-Australian alliance, and offers a more clear-sighted assessment of how it might fare under President Donald Trump. History, rightly, is his guide, and it reminds us that for much of the post-war period this great pillar of Australian foreign policy looked decidedly wobbly. Turbulence is nothing new, and the alliance can withstand it. Remember Richard Nixon’s Guam declaration, Ronald Reagan’s invasion of Grenada or Bill Clinton’s refusal to deploy US troops in East Timor, to name but a few awkward episodes that exposed tensions. Australia only moved towards becoming a ‘100% ally’ when John Howard became prime minister (although, even then, disagreements took a few points off that 100% score). The Howard years also produced a bipartisan consensus which reached it apotheosis when Julia Gillard, a one-time critic of the alliance, teared up on Capitol Hill as she recalled the moon landing. No wonder Jeffrey Bleich, the US ambassador under Barack Obama, described a ‘perfect relationship’. But perfection has come at a price. ‘Washington has simply become used to Australia always agreeing,’ complains Curran. Indeed, a ‘collective amnesia’ about past disagreements has weakened the relationship. One of his main recommendations is that Canberra should ‘disabuse senior US policymakers of the view that Australia’s support is simply automatic’. A special relationship need not be slavish and sycophantic, the trap that recent prime ministers have often fallen into. Rather, the Hawke years offer ‘something of a model for alliance management’. In those days, Washington and Canberra enjoyed a close relationship, but one that ‘did not necessarily stifle the projection of independent Australian interests.’ Disagreements actually strengthened the alliance, Curran argues persuasively, because they made it more mutually respectful and more heedful of prevailing domestic political pressures– in Hawke’s case, a restless party room, in which some MPs were instinctively anti-American. Once Donald Trump is sworn in, says Curran, there will need to be ‘a smarter alliance, one less prone to sonorous declarations of support than hard thinking informed by a greater sense of history’. That said, this kind of moment is historically unprecedented. 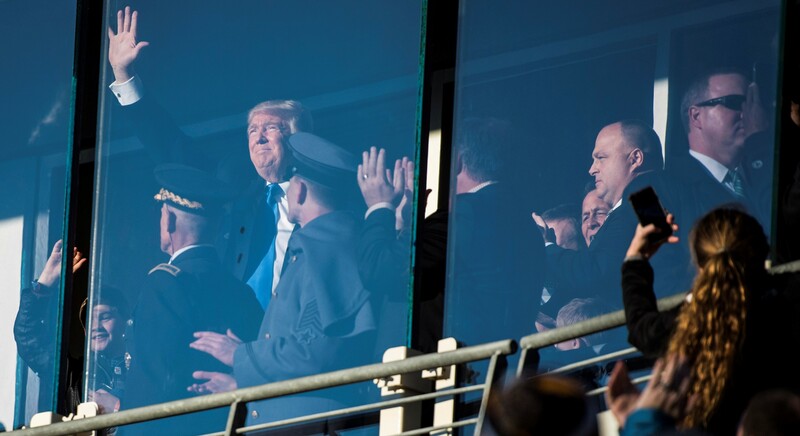 ‘The alliance has never seen anything like Donald Trump,’ writes Curran, and Hurricane Donald approaches as Australia is confronting ‘the most complex and fluid strategic culture’ since the end of the 1960s. Prepare then for a ‘degree of stress and strain that has been largely missing from the relationship over the last two decades’. This new, more volatile climate will not lend itself to a ‘single, catch-all doctrine’. Rather, diplomatic dexterity will be the order of the day. Furthermore, there are likely to be moments when Australia and the USA ‘will differ over strategy, tactics and even interests’. Fighting with America, as the title suggests, is no love story, and one of Curran’s many achievements is to de-romanticise the special relationship. In so doing, he makes the case for a rhetorical reset, one that ditches ‘dated stereotypes’ and ‘stale talking points’. By making history his main focus, he has also successfully weather-proofed the book against the latest Trump tweetstorms. It will remain essential reading long after 20 January. Rather than historical amnesia, the problem Australian prime ministers will encounter with Donald Trump is historical illiteracy. He is an ‘in-the-moment’ sort of guy, interested more in personal narratives (not least his own) and personal relationships rather than national stories and national alliances. Doubtless, he will pay lip service to ANZUS if it appears on a teleprompter before him, but will that shared history influence his decision-making or moderate his behaviour? As his views on NATO have made clear, not even the most hallowed of treaties are sacrosanct. What’s also become clear since the book went to press is that the ride will be even wilder than commentators supposed. His telephone call with the Taiwanese president demonstrated he is just as unworried about Chinese sensibilities as President-elect as he was as a candidate. That call, along with his renewed baiting of Beijing during his ‘Thank You’ tour, underscores one of Curran’s sharpest observations: that after years wondering about the implications of Chinese nationalism, policy makers in Canberra will have to think more deeply about Trump-style American nationalism. During the transition, Trump’s treatment of allies has been just as intriguing, and disorientating. Just witness his suggestion that Nigel Farage would make an excellent UK ambassador to Washington, or his offhand invitation to Theresa May, who was placed a lowly tenth on his call list: ‘If you travel to the US, you should let me know.’ The fact that Malcolm Turnbull’s phone call was set up with the help of Greg Norman emphasises just how improvisational the diplomacy will have to become. Dexterity plus plus plus, to bastardise a Trumpism. Much will depend, of course, on Trump’s choice of Secretary of State. Though not explicit, Curran’s book seems predicated on Trump being surrounded by foreign policy grown-ups, who will be more respectful of international norms and traditional diplomatic channels. But who knows? And Trump will not only have the nuclear codes in his suit pocket but also a smart phone with which he can easily override his chief diplomat, by tweet-shaming countries or leaders who have annoyed him or, perhaps, threatened his commercial interests. As Curran points out, the alliance ‘has been able to weather periods of strain and stress in the past. It has repeatedly demonstrated its capacity to adapt to changing circumstances and cope with differing national interests.’ But in this highly unpredictable world, where Trump can eviscerate years of careful diplomacy, with a single, angry digital missive, it will surely face its biggest stress test yet.